Some top notch writers have written for this anthology. All acknowledge their love and debt to Burroughs’s work. 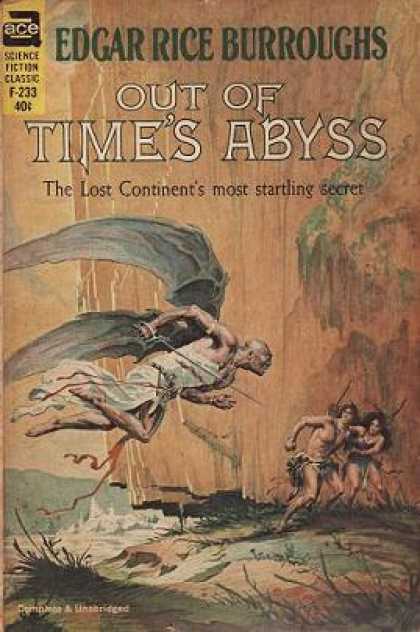 Within these pages are three Tarzan tales(one in which Joe Lansdale puts the ape man in another of Burroughs’s worlds, The Land That Time Forgot), two Pellucidar stories, a Carson Napier, Moon Maid, Mucker, a tale from Beyond The Farthest Star, and a western featuring the white man raised by Geronimo. The only reprint is a John Carter story(The Burroughs estate was contractually bound against any new Mars pieces, likely because of the John Carter anthology already out. )It was originally published in 1963 as part of a giveaway and only a thousand copies were printed. 1: TARZAN AND THE GREAT WAR – Kristine Kathryn Rusch: set during the period when the Germans had taken his beloved Jane and he was hunting for them. 2: THE FALLEN, A TALE OF PELLUCIDAR – Mercedes Lackey: an intelligent Sagath is the protagonist. 3: SCORPION MEN OF VENUS – Richard A. Lupoff: Carson Napier finds a new villain to plague him. 4: THE FORGOTTEN SEA OF MARS – Mike Resnick; the only reprint in the book. 5: APACHE LAWMAN – Ralph Roberts: Shoz Dijiji, the white man raised by Geronimo becomes a U.S. Marshal. 6: MOON MAID OVER MANHATTAN – Peter David: the Earth is invaded by the men of the Moon. 7: TARZAN AND THE MARTIAN INVADERS – Kevin J. Anderson & Sarah Hoyt: Not Burroughs’ Martians. 8: THE TWO BILLYS, A MUCKER STORY – Max Allan Collins & Matthew Clemens: falls between the two Mucker novels. 9: TO THE NEAREST PLANET – Todd McCaffrey: set in the world of Beyond The Farthest Story. 10: THE DEAD WORLD – F. Paul Wilson: a second Pellucidar story. 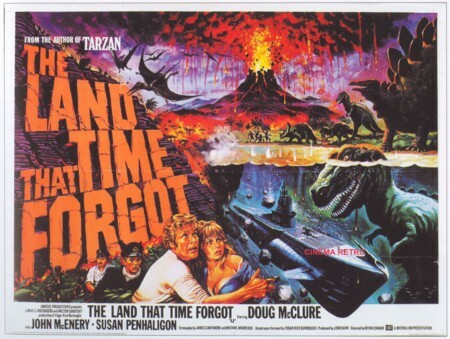 11: TARZAN AND THE LAND THAT TIME FORGOT – Joe R. Lansdale: Tarzan stranded in Caprona. Loved every story here and more than one of them demanded a sequel. Fingers crossed. Can be ordered HERE. I finally got to see this film, having to wait until it hit DVD(I don’t have Blu-ray), since my movie going days are long in the past. 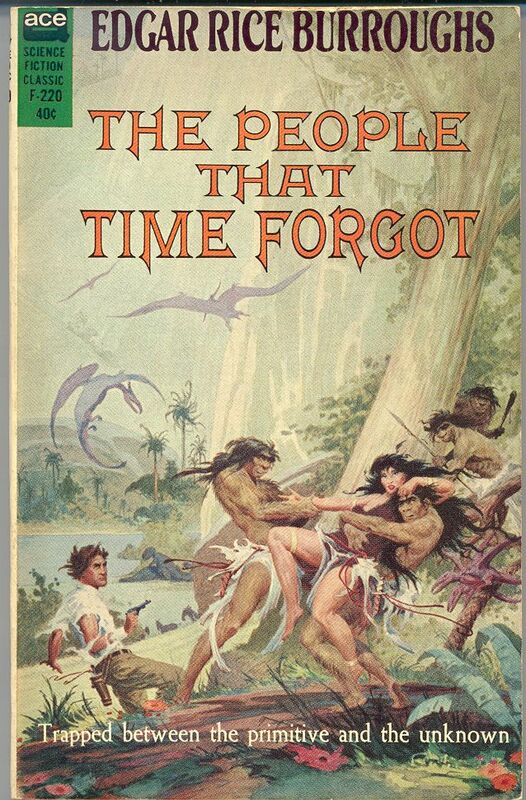 I loved this one as Edgar Rice Burroughs was one of my early finds, falling in along with such others as Heinlein, Norton, and J. Hunter Holly in my pre-teen years. A PRINCESS OF MARS still holds up well, I re-read it a few months back in anticipation of seeing this film. There were a few changes, such as his method of getting to Mars, er Barsoom, but I didn’t mind. The spirit of the novel was there and it briefly took me back to those younger days, far longer than seems possible. i can remember being twelve and wondering if I was ever going to grow up. Since I hit eighteen, it feels like it’s been downhill all the way, getting faster as the years passed. I liked the effects, the story, the overall look of the film. It was easy to see that the makers, on every level, had respect for the source material. All those morons that call this a bad movie obviously don’t read, basing their pronouncements on dollar figures. It was almost guaranteed that JOHN CARTER couldn’t make back it’s 250 million dollar budget. That doesn’t make it a bad movie and I do think by the time DVD/Blu-ray sales are done, the television money all come in, it wll be out of the red. Maybe not an overwhelming money success, but still a fine film all around. There probably won’t be a sequel though. At least we have this one. 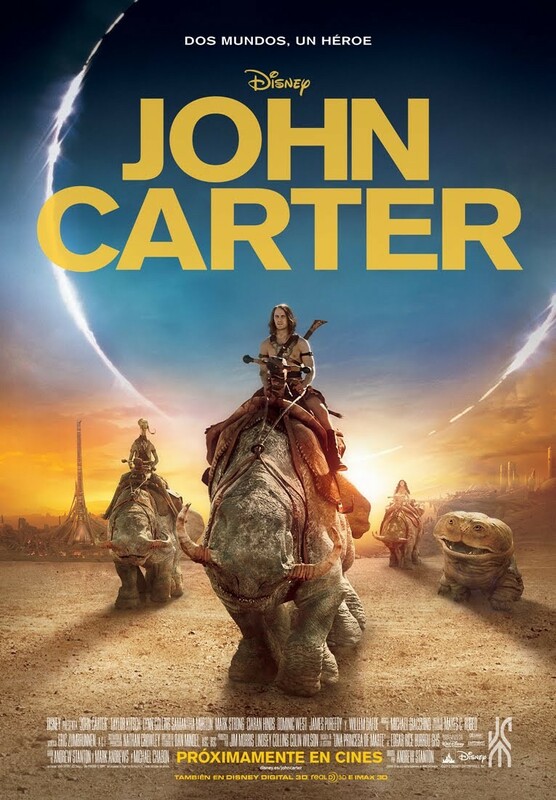 JOHN CARTER starts Friday. Here’s a ten minute clip from early in the film. March and I hope this is not a case of the trailer having all of, the only good stuff. It looks good, but with Hollywood’s track record, I’m not sure anything will work. How close they stuck to Burroughs’ work, i have no idea. I recently covered THE LAND THAT TIME FORGOT for Todd Mason’s Overlooked Movies. Truly overlooked by me, the effects were cheesy even for the time of the film. It was my discovering that Michael Moorcock did the screenplay that got me to watch the film for the first time. A Moorcock script from a Burroughs novel. How could that miss? As part of my preparation, I decided to re-read the book to refresh my memory for any changes. After all, it had been something on the order of forty years or so since I first read it. I had so much fun that I jumped right into the other two volumes which comprise one story told from several viewpoints. Bowen Tyler is our hero in the first novel. He’s aboard a liner sunk by a German U-boat during WWI(of course the Great War at the time). He rescues a young woman, Lys La Rue, from the waters, is rescued by a tug boat, which is in turn sunk by the same submarine, the survivors taken aboard. Lys was headed to Germany to marry a man who, as luck would have it, was commander of the U-boat. Tyler’s family built submarines and he knew this one intimately, allowing him to take control with the tugboat crew. A traitor amongst that crew messes with the compass and they sail south for weeks before realizing what’s happened. Low on fuel and food, they come upon an island ringed with high cliffs and Tyler remembers old stories about an explorer’s claim, that no one believed, from a couple of hundred years before. Caprona it had been dubbed. The crew find an underground channel that allows them into the interior where they discover a land of dinosaurs, humanoids of varying degrees of development, and, finally, crude oil. They set up a factory to turn the crude into usable fuel, needed for the long trip north. Tyler writes it all up and seals the manuscript tightly in a thermos and tosses it off the cliffs into the ocean, hoping someone would eventually find it, get it into the right hands, and come looking for them. The second book, THE PEOPLE THAT TIME FORGOT, concerns an expedition to rescue Bowen, Lys, and the crew. Tom Billings heads it up and when the yacht finds the island, he flies a small plane over the cliffs and is attacked by a pterodactyl, crashing the plane, and stranding him several hundred miles from where Bowen was thought to be. He has to make his way across the continent sized island, rescuing a young woman, Ajor, from death, traveling with her, and falling in love. 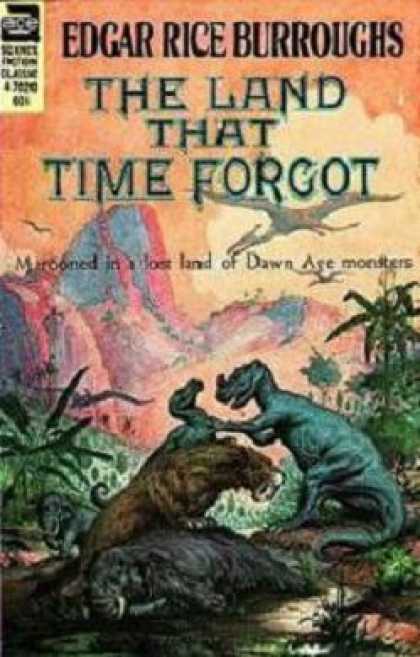 The third book, OUT OF TIME’S ABYSS, finds Bradley, last seen leaving Fort Dinosaur with a hunting expedition in THE LAND THAT TIME FORGOT, in his own adventures after being captured by winged humans and taken to their island, finding his own love, the beautiful Co-Tan, and the participants of all three books finally coming together at the end. The novels present evolution decidedly different from the norm and we gradually learn the full story as the books go along, discovering the end result. Pure pulp and I loved every bit of it. It had been a long time since I’d read Burroughs and I’d forgotten just how much fun his books were(well not really, just more sophisticated reading as I got older). But that little boy still lurks inside this weathered old hide and emerged in full glory. I still get it. I found one review, though, of someone who doesn’t seem to get it. He looked upon them as badly written books, racist, a juvenile mentality throughout. I think he judged them from a modern perspective and not in the times they were written. Definitely not great literature, but I like them a lot better than some more pretentious books. This movie was definitely overlooked by myself for a number of years. I either saw the trailer or maybe a piece of the film on televison. 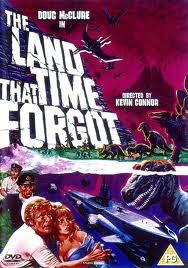 Whichever, I think I decided the dinosaurs looked so cheesy that the rest of the movie had to be just as cheesy. I just skipped it for a long time. Recently, Turner Classics ran it and I gave it a look. I knew it was based on the novel by Edgar Rice Burroughs and soon as I saw the script authors included Michael Moorcock, I sat up. This might not be as bad as I’d imagined. Make no mistake, not a great film. It still had problems, but a literate script was there. The dinosaurs were puppets and in a scene or two wires were actually visible. The pterodactyls were little more than gliders, stiff winged and looking not at all real. This was before Star Wars which changed everything in special effects. Still, stop motion might have been a better way to go. I decided to reread the novel to compare changes as it had been a good many years since I had last been through it. A couple of incidents combined to make one scene, the love triangle, not exactly though, with the U-boat commander is gone. In fact, in the film, Von Schoenvorts is not nearly the despotic, German autocrat portrayed in the novel. Those characteristics were shifted to the first officer. The only woman character was named Clayton in the film, likely a nod to Burroughs. The secret of the island of Caprona, Caspak to the natives, is never fully realized, though they begin to suspect, and the ending is quite different with a volcano erupting as a background for the betrayal that follows. I did enjoy this one after all(I’m still a kid at heart and can enjoy suspending logic now and again). I know there was a sequel and mow want to see it. That logic tells me it will, as sequels generally do, fall short of the original. an aside: in researching this post, I learned that Mr. Moorcock is, or was, facing surgery, an amputation. Some reports said a leg, others a foot. Maybe not as serious as some thought as Mr. Moorcock was making jokes about. J seems to have come through fine. I’m glad. I can empathize having been through a foot amputation myself. I hope he continues to do well.